Fantastic job Gina! What a cool cake! 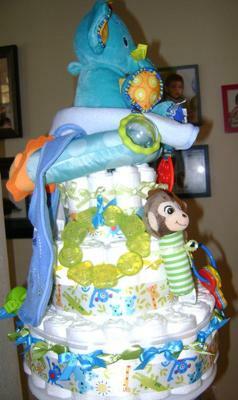 She made a fun diaper cake with an adorable cake topper, colorful embellishments and bright ribbons & bows. It came together nicely for a cute & creative diaper cake! I love the color coordination. Gina is one of our growing number of readers who are sharing their creative ideas on our diaper cake gallery and inspiring thousands of other visitors. What an awesome thing to be a part of! 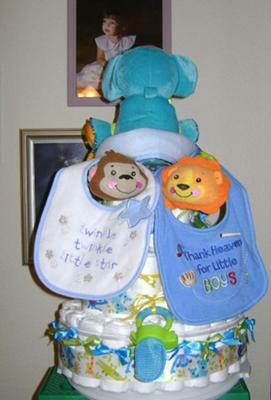 Thanks so much for sharing your fun diaper cake Gina! 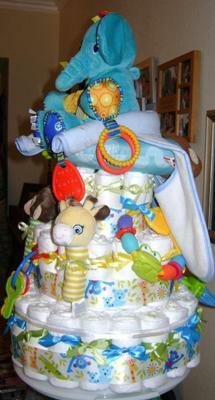 Send us a picture or two of your diaper cake and we will post it on our website for all to enjoy - for years to come. 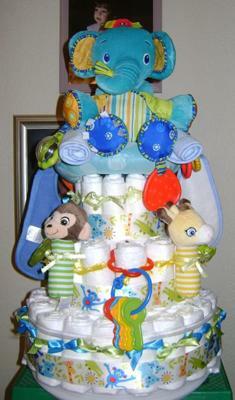 Pay it forward by sharing your diaper cake right here! I decided to go with a jungle theme for the diaper cake because the nursery is monkey-themed. I used the basic directions from this website as a key but ended up using more diapers. I think I used about 80-90 diapers. My sister-in-law absolutely loved it and didn't want to take it apart! Comments for It's A Jungle! It is really nice and colorful i'll bet everyone loved it.great job!